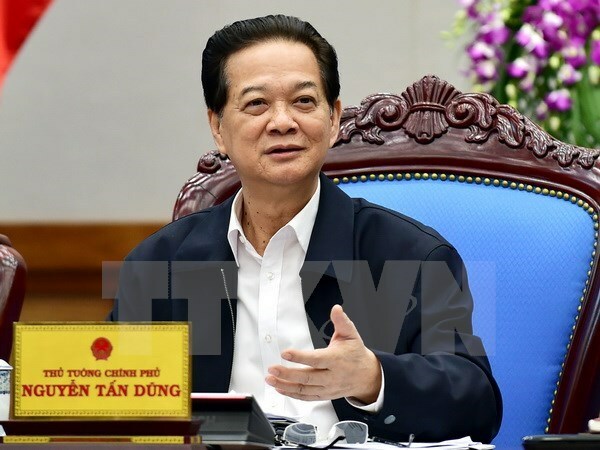 Hanoi (VNA) – Prime Minister Nguyen Tan Dung has urged better preparations to ensure goods supply and food hygiene and safety, as well as the maintenance of political security, and social order and safety for the upcoming New Year and lunar New Year festivals. Addressing the Government’s regular meeting on November 27, the PM also required effective measures to reduce smuggled and counterfeit products, fight against crimes, and reduce the number of traffic accidents. The Government leader stressed the need to provide timely, accurate and objective information about all aspects of the socio-economic situation for the press and the public in order to create a high consensus in the society, thus contributing to fulfilling all set socio-economic development targets. He lauded the positive developments in the socio-economic situation in November, including maintained macro-economic stability and major economic balances, high growth of industrial production, stable development of agricultural sector, improvements in foreign investments, positive results of administrative reform and expanded external relations and international integration. As the result, the goal of a 6.5 percent GDP growth rate for 2015 is reachable, PM Dung said, calling for further efforts and high determination to fulfil all targets set for 2015, which is an important year as the final of the country’s five-year plan (2011-2015). The PM requested ministries, sectors, and localities to focus on removing difficulties for production and business, particularly agricultural production, and on controlling the trade deficit. In particular, he emphasized the tasks of recovering over 70 trillion VND (3.08 billion USD) of debts owed to the State budget, while promoting thrift, preventing wastefulness and strictly punishing tax fraud and evasion activities. He instructed the government to make preparations for the implementation of the socio-economic development plan next year, saying that a national teleconference will be held on the preparations in late December. The leader again urged stricter implementation of administrative reform, especially in taxation, customs, and insurance, as well as the improvement of the investment and business environment, while emphasing the need to intensify information technology application in state administrative management to save time and costs, and increase transparency. Economic restructuring should be done continuously and effectively, he said, stressing the importance of the re-organisation of State-owned enterprises and the agricultural sector. Attention should be also paid to implementing the two national target programmes on sustainable poverty reduction and new-style rural area building as approved by the National Assembly, he added.